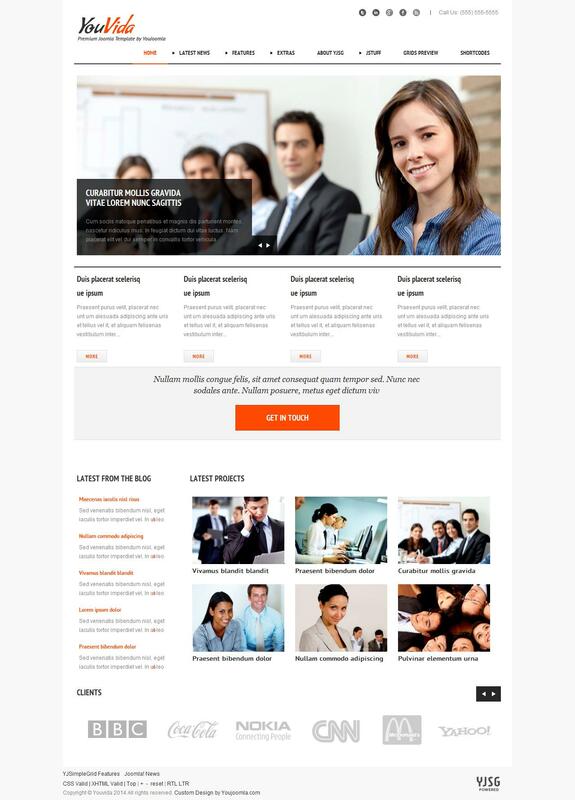 YJ YouVida - elegant business pattern in bright colors on a professional studio YouJoomla. Modern and clean layout design, including 3 color schemes, combined with studio framework YJSG Framework, perfect for creating a company's website. To increase functionality, the developers integrated template manager powerful content management web site - component K2. Built-in template manager allows access to the main parameters: the modular design, layout width settings, font selection, etc. Support flexible menu YJ Mega Menu give quick and easy navigation through the site. In the assembly composed of the best club extensions: YJ Image Slider, YouYork Module Slider, YJ Module Engine, as well as a new feedback module YJ Ajax Contact Module.